The house is a stock design by architect Rodney Pfotenhauer. 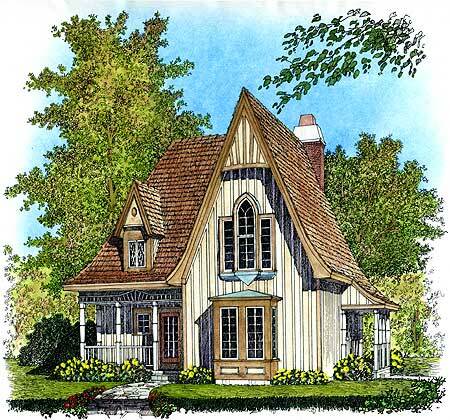 My sister and I looked at hundreds of houseplans online before settling on this Gothic revival cottage. I don’t plan to make any modifications, except that the porch trim will be a more local carpenter gothic style, and I plan to use metal rather than cedar shingles. The house is 1200 square feet. 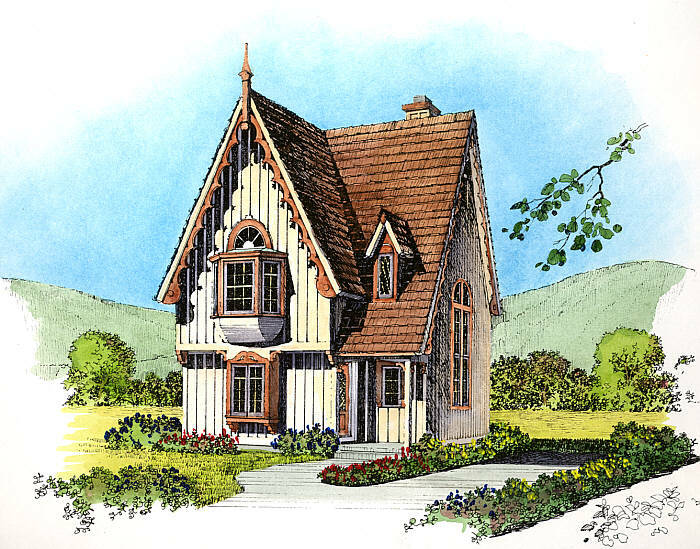 I was looking for a small house, something with a small footprint and therefore tall, something with charm, and something that would look natural hidden in the woods. I’ve never had the slightest interest in boxy modern designs or low sprawling houses such as ranch houses. Construction began in August 2008, and the exterior was completed in October 2008. I have a faxed photo of the Sagamore in Blacksburg. As you can see, it’s very tall for such a small house. 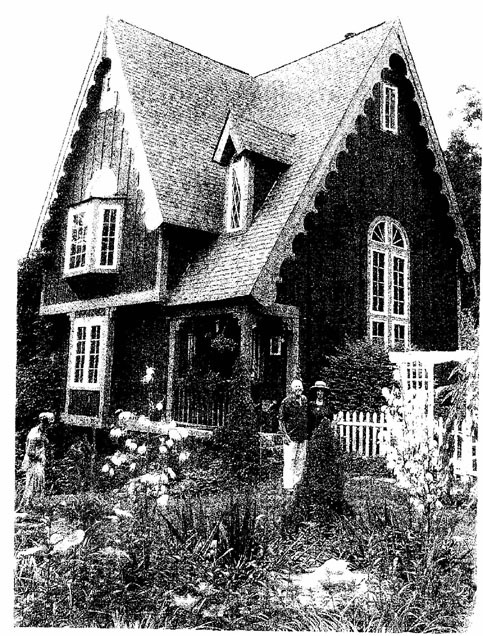 The house also cries out for overgrown, viney, art-noveau landscaping. You be surprised how much attic space there is up there. Good storage! By viney, overgrown, and art noveau, I mean a style like this, which was popular at the turn of the 20th century. It evokes a romantic version of a decaying world in which nature is reclaiming what rightly belongs to nature. Lush vines creep in and cover the decaying modern ugliness, winning out over the unnatural forces that once held nature back. Southerners have a history of fighting with nature. In the rural South, it was a sign of laziness and a source of shame to let one’s place get “growed up.” Any growing thing that threatened to flourish and cross the line was mowed down or bush-hogged. Yes that’s a metaphor that expresses a rather strongly held opinion of mine. I don’t see things that way. I will welcome the honeysuckle, bring in the climbing roses, let the grass flower, let the hedges spread, and let things get growed up. That’s another metaphor. But I still love the South, though.